Wood and ceramic artist Peter Cales first solo exhibit, “Rememory,” exploring the affects of Alzheimer’s, is on view at the Kent Bellows Studio and Center for Visual Arts thru Sept. 28. The show is the first the Center will host of professional artists involved with the nonprofit organization. According to Director Anne Meysenburg, every other month a featured artist will get the opportunity to use the gallery space and also give the students opportunity to see the show process and artists at work. After October 6’s WISHBONE 2012 student-mentor exhibit at Bemis, Kent Bellows Studio will feature art by KBS education manager Weston Thomson in November. Kentbellows.org. Bart Vargas is exhibiting a new series of paintings at Benson Star Deli opening Oct. 5 with Benson’s First Friday. 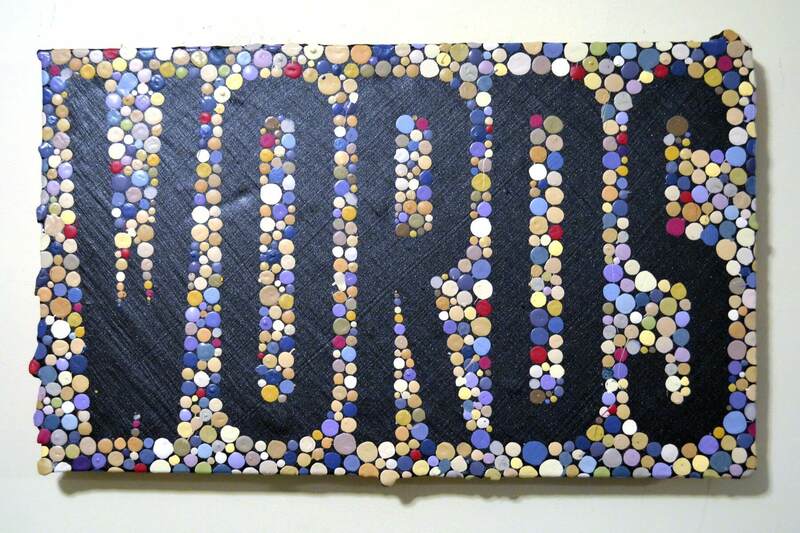 “Words” features multi-colored paintings by the Council Bluffs-based artist featuring various vocabulary (squirrel, feminist, art, to name a few); inspired by words chosen from answers to questions posted on Facebook as well as conversations with his friends and family. Bartvargas.com. LUX Center Artist-in-Residence Katie Frisch spent the last year making one hand-felted fiber piece daily. In “The Calendar Project,” opening at the Lincoln gallery Oct. 5, she displays a grid of all 365 felted tiles in wool, silk, alpaca, yarn spinning, and natural dyeing, to celebrate her residency experience. Luxcenter.org. Oct. 5 The Dirty Haiku Project debuts its Full 69 Show. Just one night at The Bourbon in Lincoln, sixty-nine photographs from the Project will be on display alongside Resplendent Jezebel Burlesque dancers. The Dirty Haiku Project, a collaboration between poet Heather Sticka and photographer Rob Liliedahl, features images of her friends and volunteers donning her scripted sexually explicit haiku, photographed by Liledahl. They aim to take the show on a national tour. Thedirtyhaikuproject.com. Nebraska Arts Council recently announced their 2012-13 Governor’s Residence Exhibition artists: Christina Narwicz (painting), Yelena Khanevskaya (painting), Rick Johnson (painting), Bill Hoover (painting), Jason Jilg (photography), Liz Estudillo-Chaffee (painting), Cindy Chinn (painting), Randy Wain (photography), Tamara Ruiz (painting), Lance Wurst (painting), Heath Draney (mixed media), Tim Guthrie (painting) and Terri Allen (mixed media). The Nebraska Governor’s Residence is located at 1425 “H” Street, in Lincoln. Nebraskaartscouncil.org. Bemis Center is taking applications thru Sept. 30 for Artists in Residence July -Dec. 2013. Artists worldwide come to live and work in the supportive community to confront new artistic challenges with access to their facilities and a monthly stipend. Too, they are seeking an Executive Director for the nonprofit organization. Apply at bemiscenter.org.